Italian ryegrass can produce very high quality, leafy, palatable forage suitable for high producing dairy cows. As a cool-season bunch grass, it is best adapted to cool, moist conditions. It does not grow as well in hot, dry summer weather. In Ontario it has been seeded in early spring (April, early-May) for harvesting that year. More recently, it has been seeded in August for harvest in late-fall and then again during the following year. This can provide an excellent double-crop option, but the risk of winterkill must be managed. Italian ryegrass is noted for its high fibre digestibility (NDFD), high relative forage quality (RFQ), palatability, ease of establishment, and its yield response to nitrogen. Ryegrass is characterized by a glossy appearance of the underside of the leaves. Do not confuse cereal rye (Secale cereale) with ryegrass (Lolium multiflorum or L. perenne), as they are totally different grass species with distinctly different characteristics. Westerwold ryegrass is a true annual that will aggressively produce seed heads the year of seeding, and will be killed by winter. Westerwold seed is cheaper and is more commonly used as a cover crop. Italian ryegrass is actually a winter annual that has a vernalization requirement (exposure to cold temperatures similar to winter wheat) for flowering, so it will not form a stem and or go to seed the year of seeding. It will produce a seed head the following spring if allowed to mature before harvest. Italian ryegrass is sometimes confused as an annual when it is killed by winter. Newer varieties have been developed and selected with more winterhardiness. An advantage of Italian ryegrass in that it will stay vegetative the year of seeding. 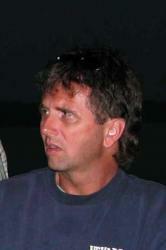 It will not form stems and head out the year of seeding, with the subsequent dramatic drop in forage quality. When seeded in the spring and harvested throughout the year, Italian ryegrass rarely survives the winter. If seeded in early-August, Italian ryegrass can provide a late-fall harvest and some early season forage the following spring. A single cut can be taken in May, after which the field is replanted to corn silage, soybeans, edible beans or sorghum-sudangrass. An alternative is to keep taking multiple cuts until the stand becomes unproductive. Because it is so leafy with a unique texture, Italian ryegrass is more difficult to make into dry hay than other grasses, including Westerwolds. Dry hay is easier to make with Italian ryegrass in July and August. It can be made into haylage anytime, and makes excellent baleage. 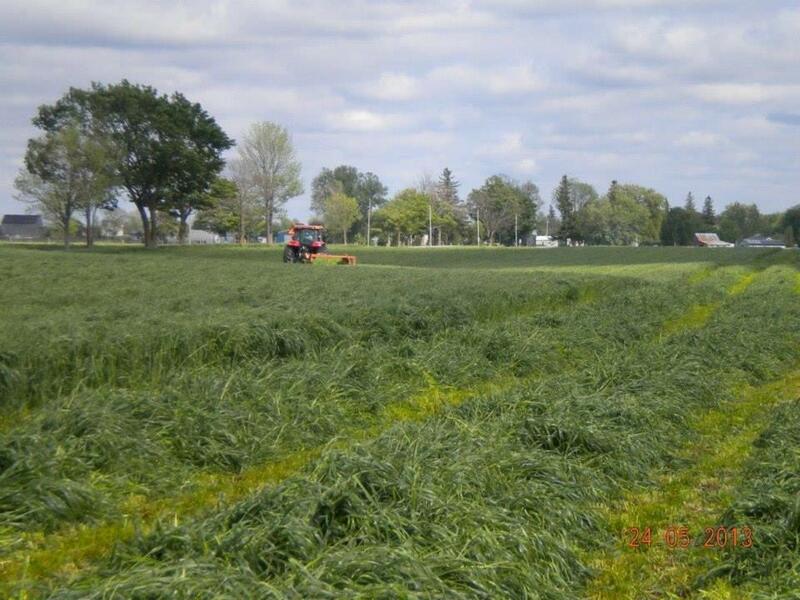 Perennial ryegrass is also grown in forage mixtures in Ontario, although it has some issues with persistence. 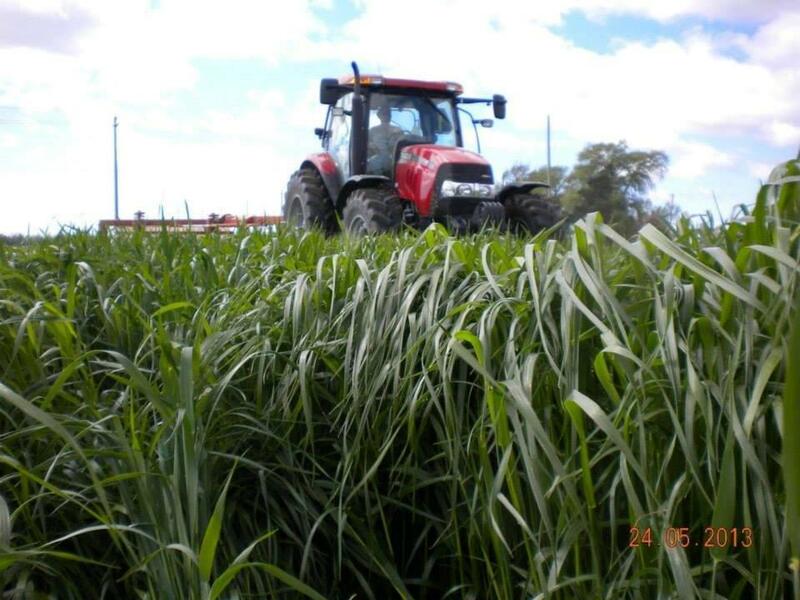 Some ryegrasses are intermediate in characteristics between Westerwold, Italian and perennial, so it is important to buy a reputable variety or brand. Italian ryegrass produces excellent forage quality with high digestible energy, RFQ, palatability and intakes. Nutrient quality will be dependent on the cutting schedule. Ryegrasses are higher in nutrient quality than other cool-season grasses at the same maturity. Fibre digestibility (NDFD) and intake are exceptionally high, enabling higher forage diets be fed to high producing dairy cows. If fertilized with nitrogen, crude protein levels are much higher than what many expect from a grass species. High in sugar content and soft textured, it is extremely palatable and usually limit fed with other forage in the ration. There are variety trait differences, including yield, maturity, cold tolerance and persistence. Ontario Forage Crops Committee variety data is available at www.goforages.ca , but there is very little on ryegrass. There are diploid and tetraploid varieties. Diploid varieties tend to have more dense tillering and better winter survival. Tetraploids have faster germination and regrowth, higher yields, and greater rust resistance. Some seed companies sell brands that contain blends of both diploid and tetraploid varieties in order to balance persistence with yield and quality. Italian ryegrass is very quick to establish with good seedling vigor, with germination taking 7 – 10 days. The seed is light and fluffy. Packing and good seed-to-soil contact is essential. Seed into a fine, firm, level seedbed as early as practical in the spring, or in early-August if the intention is to over winter the stand. A brillion seeder works very well. It could also be planted with a conventional or no-till drill at a depth of ¼ inch (½ inch if soil conditions are dry)., Roll or pack the field after planting. Broadcasting or air seeding onto a well tilled seedbed and packing is another option. Sprocket packers are preferred over flat rollers. The recommended seeding rate is generally 35 – 40 lbs/acre. When it is no-tilled in the spring into an old or winter injured alfalfa stand to boost yield, it is seeded at about 15 – 30 lbs/acre. Phosphorus and potassium should be applied in the rotation according to soil test results. Manure can be applied before establishment. Because ryegrass establishes quickly and grows thick and aggressively, herbicide weed control is usually not required. (“Guide To Weed Control, OMAFRA Publication 75, http://www.omafra.gov.on.ca/english/crops/pub75/pub75ch10.pdf ). Ryegrass responds well to nitrogen (N), with both a large yield increase and an increase in crude protein. Regular N applications are essential to high yields. For establishment, apply 50 lb/ac of actual N either by broadcasting and incorporating it prior to seeding, or broadcasting 3 weeks after planting. Apply an additional 50 lb/ac of N again after cutting for each additional cut. For fall seeded Italian ryegrass, apply 50 lb/ac of N at green-up in the spring (April). Italian ryegrass is normally ready to cut at 8 weeks after seeding with about 14 – 18 inches of growth in a thick dense stand. A cutting height of 4 inches allows for faster regrowth by leaving energy stored in crowns and leaf area for photosynthesis. Because ryegrass is so leafy, disc mowers work much better than sickle bar mowers. Italian ryegrass can offer a good double-crop forage option by seeding after winter wheat or cereal harvest in August or early-September for a fall harvest, subsequent over-wintering, and then cutting again in May. Early-August is the optimum time to seed to allow for more growth and an earlier harvest. There is always a risk of winterkill which can be partially mitigated by variety selection and fall cutting management. There was a higher incidence of winterkill following the harsh winter of 2014. When winterkill does occur, consider that the ryegrass has provided excellent winter cover crop benefits, and possibly also some late-fall forage. Nothing has been lost, as there is still the opportunity to plant an alternate crop in that field in the spring. Because Italian ryegrass will not elongate a stem and produce a seed head in the year of seeding, the fall growth will be all leaf, short but very thick. It can be harvested at a 4 inch cutting height about 8 -10 weeks after seeding. Harvested in October or very early-November, it will be difficult to wilt and will need to be harvested at a high moisture level. To reduce the risk of winterkill, avoid excessive fall growth going into winter. Growth of about 4 – 6 inches is ideal. Either too much growth or not enough can result in winterkill. If a fall harvest is not planned, seeding should be delayed until mid- to late-September to limit excessive growth. After going through the winter, fall-seeded Italian ryegrass has become vernalized and will head out, so it should be cut aggressively for high forage quality. First-cut should be timed in late-May before the boot stage to avoid a rapid decline in forage quality. For high quality forage, it is important that subsequent cuttings be at 28 day intervals. Yields of Italian ryegrass are quite variable, and are very influenced by seeding dates, rainfall, temperature and fertility (especially N). With good management, spring seeded Italian ryegrass can often yield 2.5 – 3.5 tonnes/acre of dry matter over 3 cuts. When late-summer seeded, a fall cutting plus one cut the following May can provide similar yields of 2.5 – 3.5 tonnes/acre. Depending on moisture, subsequent summer cuts can each yield an additional 0.5 – 1.0 tonne/acre of dry matter. Italian ryegrass is sometimes used as a companion crop with spring seeded alfalfa. Similar to oats, it establishes easily providing early erosion control and weed suppression. 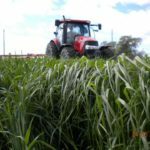 Italian ryegrass does not yield as well as oats, but nutrient quality and palatability is greater, making it more suitable as high producing dairy cow feed. However, in optimum cool, wet conditions, the ryegrass can be too competitive with the alfalfa, reducing establishment and damaging the stand. In droughty conditions, ryegrass may not provide enough cover. Recommended seeding rates based on research at the University of Wisconsin are 2 – 4 lbs/acres. Italian ryegrass can provide good yields of very palatable, high quality forage when seeded in either early-spring or late-summer, but careful management is required. It has been used successfully by emergency seeding into winter injured alfalfa stands to boost yields. If the intention is to seed in late-summer or fall for harvest the following year there is a risk of winterkill, so careful attention must be made to variety selection and fall-cutting management.